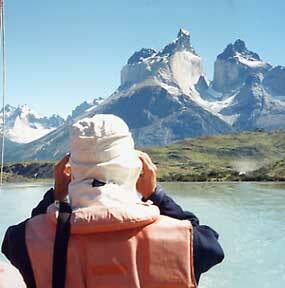 Chile - Chile is the most spectacular country in Southern America. I was more than impressed when I flew into Santiago, the capital of Chile. We were still high in the air when I looked up at the towering peak of Ojos del, 23,239 ft (7,083 m), the second highest of the Andean peaks in South America. It scraped the universe. The Lake District further south is no less impressive, with its deep blue mountain lakes, snow-capped volcanoes, and pristine forests. Sports operate here year round. I ride horses with newly found Chilean friends to stunning waterfalls and some of the strangest plants I have ever seen. Sometimes you know you're not in Kansas anymore. I boarded an inland ferry on the way to Patagonia in southern Chile. We passed through hundreds of tiny island without seeing another ship for days. I was at the end of the world. I climbed among the Torre Del Paine Mountains near the tip of Chile, marveling at the glacier filled lakes and 5000 foot cliffs, some the tallest in the world. I slumbered in special mountain huts, waking in the morning to stunning sunrises. Go there for a real adventure in your life. Argentina - Argentina is the most European country in South America. It's like I never left Italy, Germany or France. The boulevards of Buenos Aires, its capital, are wide and its people are beautiful. The use of Plastic Surgery per person is the highest in the world. Argentina is the country of Gauchos, Argentinean cowboys; Mate, a tea with an acquired taste; and Pampas, the wild, empty lands lying to the south. It is the home of Jews running away from the Nazi's in the 1930's and Nazi's running away from everyone else ever since. It is the land of Eva Peron, self proclaimed protector of the people in the 1940's and 50's. Here is also found a most unique dance, the Tango, a national obsession, which carries its dancers in a close embrace. They dance, almost walk their way through improvised, yet passionate movements. One is the leader as his partner is his ardent shadow. Dance your way to Argentina in South America and join the passion! Brazil - You can't have any more fun in South America than in Brazil. The people from Brazil are the most lively, swaying, sambaing people on the planet. The beaches are as legendary as its slavery past is grim. Its history, its lands provide endless places to visit and enjoy. You can go on breathtaking trips on the Amazon River, visit rain forests and try hundreds of types of fruit juices with tastes you can't imagine. If you want to find romance in Rio de Janeiro, the world's most beautiful the city, go no further than Ipanema, her famous beach scene, and Bossa Nova's greatest hit, "The Girl from Ipanema." Take Rio's other famous daughter, Carmen Miranda, Brazil's greatest singing star in history. Period. This Brazilian singer and actor entertained and impressed more people, than any entertainer in her day, the 1940's to the 1950's. Carmen Miranda has her own museum not far from the famous Copacabana Beach. Visit it on your next trip to Brazil. Cheap Hotels in Argentina - Argentina is very European with wide boulevards, beautiful people, Gauchos, and Eva Peron. Explore it all on a budget; we can help. Cheap Hotels in Brazil - Brazil is the largest country in South America. Famous for its football (soccer), cultural diversity, Amazon rainforests and world-class landmarks such as the Iguaçu Falls. There is plenty to see and to do in Brazil. We'll make it easy and cheap. Cheap Hotels in Chile - The capital city of Chile, called either Santiago de Chile or simply Santiago, is much more than just the main international gateway to the country. It is a popular tourist destination itself, with great museums, galleries, churches, parks, and monuments to visit. Any way you look at it, staying in one of the cheap hotels in Santiago is a great idea for a great vacation. Rio de Janeiro Travel Source - We'll will give you all the information you need for a fun and exciting trip to Brazil, but to truly experience Rio you have to see it for yourself! Rio de Janeiro is notorious for its all-around beauty. The Cidade Marvilhosa (Portuguese for Marvelous City) truly lives up to its name. Voted among the Top Ten as a best world travel destination, Peru has a LOT to offer. From the Amazon jungle and world-class surf beaches to the famous Machu Picchu, Lake Titicaca, Nazca Lines, and more, find out everything you need to know about Peru. De traditionele manier om naar Machu Picchu te gaan is met de trein. Je vertrekt vanaf San Pedro station, Cusco, vroeg in de ochtend. Na bijna 3 uur zul je aankomen in Aguas Calientes, om vervolgens naar Machu Picchu te lopen. This website is mainly in Spanish but has a lot of English pages and focuses on towns, such as MiPuebloNatal (My Home Town), one of many great travel destinations.